By Justin Wier | June 22, 2018 at 12:10a.m. 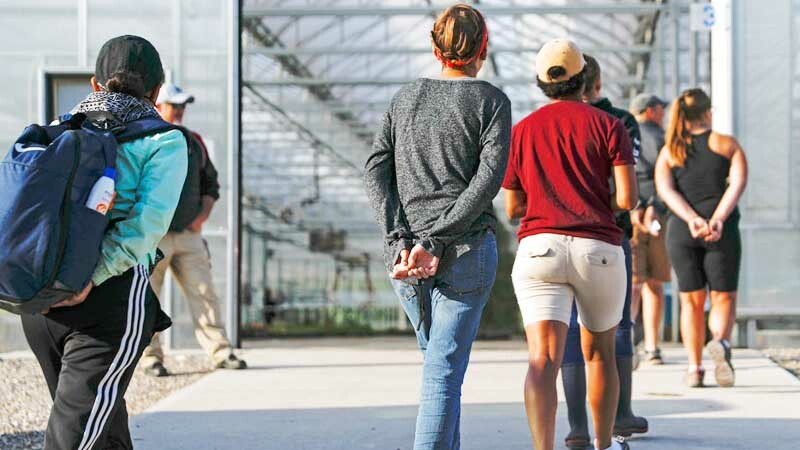 About 60 workers at the Fresh Mark plant in Salem who were detained in Tuesday’s raid by U.S. Immigration and Customs Enforcement have been released, an ICE spokesman confirmed Thursday. The remaining 86 workers swept up in the raid are being detained at the Northeast Ohio Correctional Center on Hubbard Road and the Geauga County jail. Khaalid Walls, northeast regional communications director for ICE, said the men were sent to the East Side private prison and the women were sent to Geauga County. Video released from the June 19 raid by ICE on the Salem Fresh Mark plant. With 146 workers detained, the raid on the meat-processing plant was the largest workplace raid carried out under the Trump administration. ICE agents also served warrants at Fresh Mark offices in Canton and Massillon to collect documents. Walls said the investigation continues and could result in additional charges. He did not rule out charges against Fresh Mark employees who may have hired workers in the country illegally. ICE’s Homeland Security Investigations began its investigation of Fresh Mark more than a year ago based on evidence that the company may have knowingly hired those in the country illegally. Brittany Julian, a Fresh Mark spokeswoman, said in a statement Tuesday that the company has worked with ICE and uses E-Verify, a program that compares information on employee eligibility forms with U.S. government records. On Thursday, Julian said the company’s facilities are operating as usual and said the company couldn’t operate without its committed workforce. She added that job openings are posted at www.freshmark.com. Walls said humanitarian reasons including health and family concerns are why some of the detainees were released. Sister Rene Weeks, of St. Paul Parish in Salem, said many of the 60 released workers had entered the country legally and lacked proper documentation at the time of the raid. Those released for humanitarian reasons included parents who had children left behind after the raid as well as one woman who is several months pregnant and another who has leukemia. The children whose parents had been caught up in the raid have all been accounted for, she said. “Most of the children, almost without exception, are back with their immediate families or relatives,” Sister Rene said. The church helped care for the children the night of the raid. She said those who have been released experienced a range of emotions. “They were pretty terrified when the raid happened and relieved to be back with their families, but they are also worried about what comes next,” Sister Rene said. Sister Rene said many of those who were released met with immigration lawyers Wednesday at St. Paul Parish. Union representatives also arrived in town Thursday. The majority of those detained in the raid were Guatemalan nationals. Guatemalans who fled violence in that country comprise a large percentage of Salem’s immigrant community, Sister Rene said. Much of that community feels frightened, she said, because they don’t know who wants them gone and who would be willing to lend a helping hand. Sister Rene has traveled to countries including Guatemala, and while she said she generally supports laws, she also has compassion for families who fled those countries. For those interested in helping, Sister Rene said to make monetary donations to St. Paul’s Church or First Christian Church in Salem, both of which have outreach programs for the local immigrant community. She asked people to indicate that they want their checks to go toward those affected by the raid. The money will go toward rent, utilities and food for affected families. Many of those detained are now out of work, she said, and other families lost their sole providers. “Folks need some breathing room to figure out what comes next,” Sister Rene said. June 21, 2018 12:01 a.m.
June 21, 2018 10:55 p.m.